When a Contractor engages the services of a Subcontractor the Contractor must verify the Subcontractor details with HMRC BEFORE the contract starts in order to determine the tax treatment of payments to that Subcontractor. Please note, since April 2017 HMRC will no longer accept requests for subcontractor verifications by telephone – all such requests must be done online. 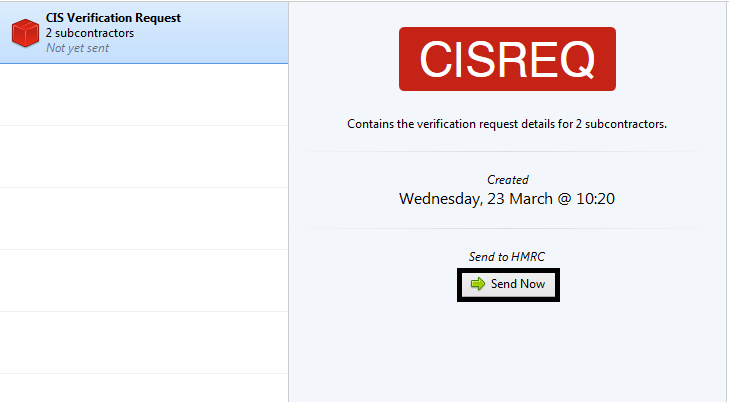 To send a verification request using BrightPay, simply select "CIS" on the menu toolbar. 2) Click "New" on the menu toolbar and select "CIS Subcontractor Verification Request"
3) Select the subcontractors you wish to include in the verification request, Click "OK", the contents of the verification request will be displayed on screen. The verification request can be printed or exported at any time before or after its submission to HMRC by clicking 'Print' or 'Export'. 4) When ready to submit to HMRC click "send now". 5) Confirmation details will subsequently appear on-screen to indicate that your submission has been answered by HMRC. 6) Should your submission fail, simply click on the 'Details' button for more information on why your submission has been rejected by HMRC and correct your subcontractor information where required. Once the verification request has been submitted, the subcontractor details can be updated. To update the subcontractor records with the tax payment status and the verification number in the response from HMRC click "Update Subcontractors". Once the subcontractor records are updated, this will be indicated by a green tick and the submission will show that it has been accepted by HMRC. Please note verification requests can also be prepared by accessing the "sub-contractors" menu in the CIS utility and selecting "verify".